Welcome to my "Fix Pain From Sitting" article. You are on my web site DrBookspan.com, a large no-charge site for you to be better, fitter, healthier, smarter, simpler, sometimes funnier. I am a research scientist and clinician in human physiology and performance in extreme environments. I study why common training techniques and rehab methods don't work and what works better. I develop evidence-based methods that you can use yourself, right away, to fix your neck pain, back pain, knee pain, other injuries, learn smarter stretches and training for every day and for extreme environments. I also worked many years in lab research in environmental medicine of the human body in extremes of heat, cold, injury states, altitude, underwater, and different nutritional states, and put some of those fun stories here on this site, too. This Get-Started-Right-Now article shows you how to spot and fix painful sitting habits. You can fix causes of your own pain yourself, now, today using this summary. Don't wait. Not all exercise is medicine. Not all medicine is healthy. I change that. Sitting around too much has never been healthy. For the sitting you need to do, this article shows how to stop main unhealthful sitting mechanics that cause back, leg, arm, hip, and neck pain. Most lists of instructions for sitting tell you to sit in exact ways at exact angles or use devices and special chairs. These are uncomfortable and not necessary. Instead, this article shows you concepts of how and why strain and injury may occur when sitting so that you can sit in healthy ways that are comfortable and easy. Then you no longer will get the pain and your neck, shoulder, and back can recover quickly. You can sit healthfully on a bucket and badly in a thousand dollar ergonomic "posture" chair. Also remember to get up and get outdoors in fresh air and a healthy amount of daylight exposure every day. For more, get my BOOKS, see you in one of my CLASSES, over a private e-mail consult, or maybe in a rare private appointment. More about me in Adventures. SITE MAP. At the bottom of this page (and every page) are main navigation links, plus buttons to SHARE, TWEET, and LIKE. Now go get better, and the world will be better. If you have other poems or songs for health, send them through the Projects Page. Winners appear on this site. You do not need special chairs or expensive ergonomic foot rests or a ball or rocking device, or any of the positioning devices claiming to relieve pain or to "make you sit in healthful ways." You can sit badly on any of them, or sit well on a bucket - with a little info and practice given in this article. You do not need to give up working at a computer or desk, or avoid car trips. With a little common sense and information, you can sit and move in healthy comfortable ways right away. This is different from doing sets and reps of exercises, or devices to "hold" you correctly (when they really don't), then going back to injurious daily habits. You do not need to sit in specific rigid angles of the hip or legs or arms, or hold a presumed "correct" position. That often causes more pain. Instead, by learning concepts of healthful movement, you can apply them in all the various situations you will need. Painful muscles, discs, or joints are not the cause of the problem - they are the RESULT of what you are doing to hurt your body - things you can fix yourself. Even when inflammation or immune response are identified, they are results, not causes. This article will show you how to understand and fix causes instead of using drugs and surgery or bracing and devices for the results. 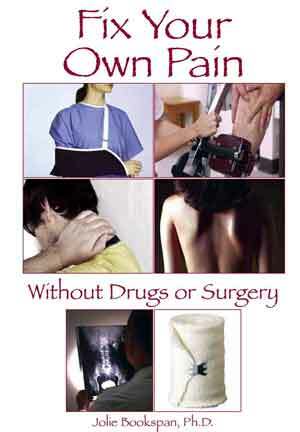 A number of common medicines and prescription drugs can cause much body pain. This may be mistaken for pain from sitting. Unneeded treatments, surgeries, and pain products are used next to relieve this pain - often causing more pain and reduction in physical ability. Easy changes can stop the need for harmful medicines. Not all pain is from the results that show on an x-ray or other test or scan. You are not doomed by scan results. Anyone who sits immobile for hours can hurt or feel stiff. That is not a mystery. 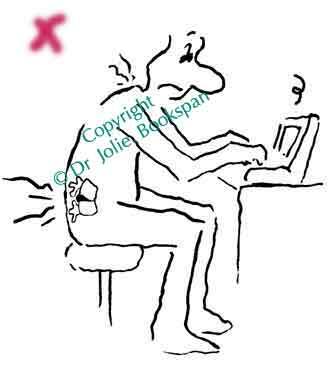 Anyone sitting badly, squashing one area, can have numbness there that is not from disc or nerve problem, even if you have been told that your x-ray shows a disc bulging. Many people have bulging discs with no symptoms, and their pain is from normal bad slouching. No surgery or treatments or repeated adjustments are needed, only better sitting and more getting up. Bad sitting is no mystery. Research reports of posture rules, stretches, and devices for sitting seem to show they make as much or more pain as slouching, and do not create healthy relaxed sitting. They are also no fun. First, healthy lengths needs to be learned. Then sitting builds-in comfortable healthy habit. 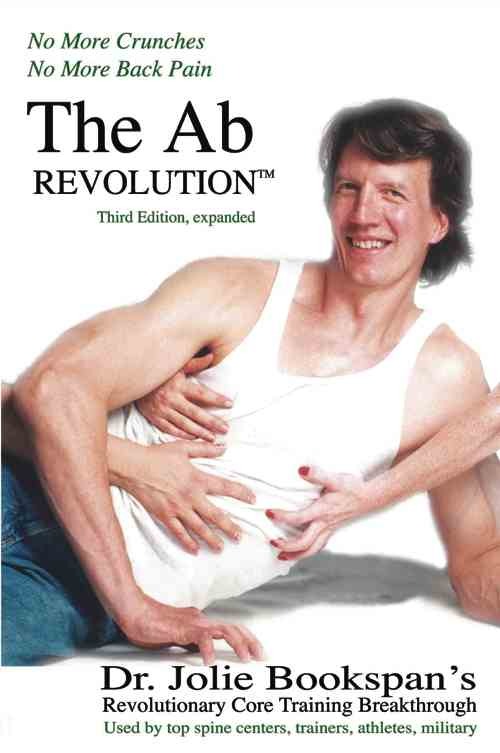 This is not alternative medicine. This is standard of care, common sense sports medicine techniques, applied to real life - where you actually need it. This article explains the above. Make sure you understand the concepts (many highlighted in green). The end of this article (where it says "More fun...") gives many helpful links to pages on this site for more help. The Bottom of every page on my web site gives main navigation links. It does not matter if you sit for work, hobbies, travel, or to do exercise on a ball or ergonomic chair, or any other sitting, it can hurt from simple bad body mechanics. No expensive chairs or devices make you sit right, but you can easily do that yourself, even on a bucket. Rounding your spine forward (slouching) when sitting is a main way to make muscles ache. Sitting with your spine too rounded, or bent forward all day, even leaning forward chronically with a straight back, can also slowly degenerate the discs, the little cushions between the back bones (vertebrae), and push discs outward. 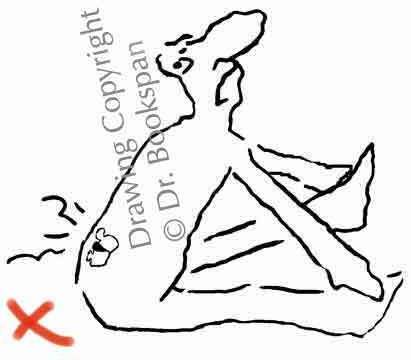 This is how discs bulge, also called herniated or slipped. Holding your neck tilted forward for much of the time, or angled with the chin jutting forward and/ or upward, also mechanically harm soft tissue, discs, and spine joints in the neck. A disc can bulge outward enough to press on nearby nerves, sending pain down the nerve distribution. Pain down the back of the leg is called sciatica. Pain can also go down the front of your leg when other nerves are pressed, and down your arm from neck and shoulder bad positioning. Even without disc involvement, soft tissue pain from slouching can be uncomfortable and frightening, often mistaken for diseases, and given unnecessary drugs and treatments. These are all easy to prevent. 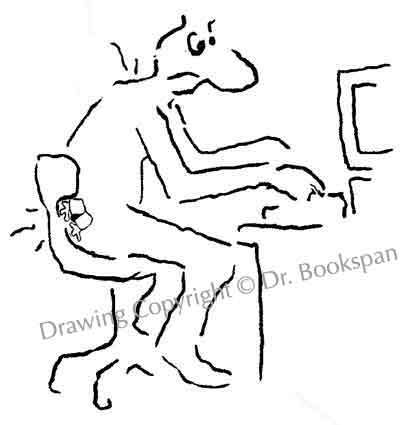 Pain when sitting badly at the computer - "Cyber-myalgia"
Years of rounding and sagging under your body weight pushes on soft tissue and and can eventually wear on the discs, pushing them outward (herniate). Look at the discs drawn in the illustration showing how bending the spine forward pushes discs outward toward the back, little by little. More about discs in the DISC article. The same problem occurs when you sit rounded forward for exercise, even bent forward "with a straight back." Damaging forces work on discs in both cases. The fact that you are exercising does not make the sitting healthy. Examples are standing or sitting bent forward or sideways to touch ankles or toes, sitting bent forward, yoga and Pilates poses such as plow and shoulder stand - where you lie on your upper back with legs in the air (like sitting upside down) with body weight pressing on the discs of your back and or neck, depending where you are bending from and how much. Not all exercise is good for you, just as not all foods or drugs are good for you. Yoga was never intended to be completely healthy for joints. Many moves were for performance art, dance, penance, purification through pain, battle moves (early yoga sects murdered each other. Some poses based on their preparatory exercises or retelling of the story). There are many healthier moves to do instead. More interesting info to make your yoga healthier is on the Yoga class page. More about how hamstring stretching got confused for back stretching and fixing back pain is on the Hamstrings article along with healthier hamstring stretches. Do you round your back all day to work, to drive, then the same to "relax." Too much. No wonder your neck or back hurts. Many seats have a round (concave) back. Do you allow your back to round to fit the round chair back? Check if you not only round into the chair back, but hunch forward even more, or put a pillow behind your head, pushing the head further. 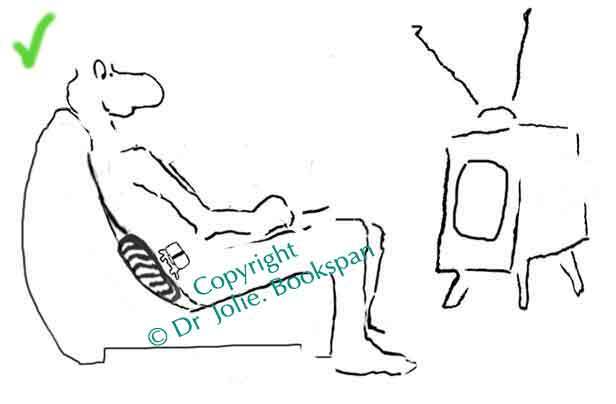 Do you sit away from the back of the chair, and create a "hammock" of your spine?. Body weight pushes outward on your low back muscles and discs. Photo shows tight, rigid, too much inward curve of the lower spine - a common way to get a tight, sore back and neck. Holding an overarched lower spine (overdoing the inward lumbar curve) and yanking the chin inward (double chin posture) can hurt, tighten, or strain as much as slouching. 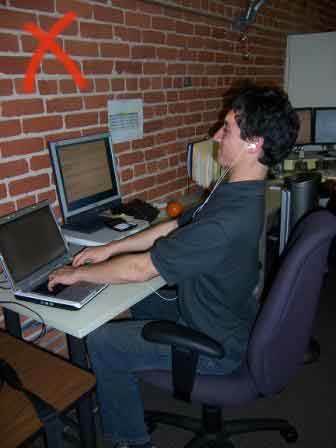 The above photo shows rigid strained forced posture. 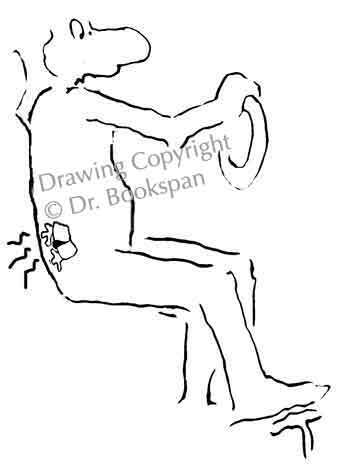 Tightening the back muscles in attempt to "sit up straight" causes much back pain. There is no need to sit in specific rigid angles of the hip or legs or arms or feet, or hold a presumed "correct" position without moving; That often causes more pain. 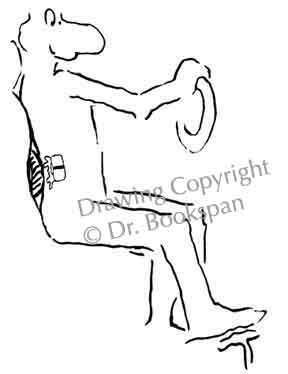 Regular movement in your chair, looking around, reaching and retrieving is needed movement. Get general concepts of healthy movement and apply them to all the different positions you will need. Please do not memorize "rules" of sitting angles and make yourself hurt holding them. Instead of slouching forward or tightly upright in your chair, move your hip all the way to the back of the chair. Lean back in comfort. If the chair back is rounded, put a small soft cushion in the space between your low back and the chair, to preserve healthy SMALL normal back curve instead of assuming the curved posture of the chair. Relax back over the small roll to keep the normal small inward curve, instead of rounding your back outward to fit a curved chair. 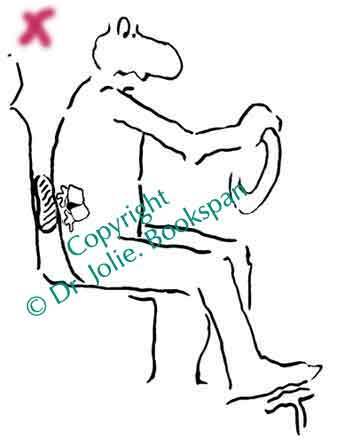 Don't exaggerate the inward lumbar curve, and don't strain to hold it, or you will cause pain from that too. To feel the right size for a lumbar roll, sit back in a chair and nestle your forearm behind you in the lumbar space between your lower back and the chair. Lightly lean your upper back against the chair so that the low back does not press your arm, but rests lightly. It should feel comfortable. It it's not comfortable, it's wrong. Your forearm is usually about the size to look for in a lumbar roll. A "roll" can be a folded towel. It is not always "roll" shaped. It is just the name of the pad needed to change a bad chair to one that you can be healthier in. Use your brain to fit it to pad the shape of the chair as needed. There are commercially available rolls. Some are expensive and cumbersome, and many are uncomfortable. You do not need to purchase anything. Many soft household items can work for a lumbar roll. Try a small folded towel, shirt, or gloves. Fold your jacket or part of it, just enough to be the size you want. If it is too large, it will not be comfortable. A small inflatable pillow, available at dollar stores or camping supplies is excellent for travel. LIghtweight and deflates to take up little room. If a soft foam lumbar roll is too big, cut it lengthwise to make two - one for home and one for the car, for example. 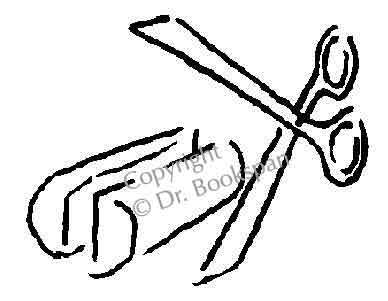 Put the cut side to the seat and the rounded side facing your lower back. Don't use hard foam rollers, they are much too rigid and uncomfortable. - Lean your upper back against the chair instead of pressing your lower back against the roll. - Bad chairs will always be everywhere - movie theaters, conference halls, waiting areas for all the things we wait for. There is almost always a sweater, or jacket sleeve, or carry-bag that can be comfortably placed when you are caught in unexpected bad chairs. Refold or resize the materials you are using for your roll to fit a different chair. Use the principles to sit back comfortably. That doesn't mean to never move. Move in relaxed comfortable ways for all the reaching and looking you need at your desk. Do you round your back against the lumbar roll? That is uncomfortable and just as useless as rounding without one. - Use a lumbar roll, described above, if needed, depending on the shape of the car seat. - Sit with your hip at the back of the seat, if you can safely reach. A pillow may be needed. - Depending on car configuration, and your height, see if you need to move your seat further forward, so that you do not round forward or downward to reach the desk or steering wheel. Then tilt the seat slightly backward if needed and safe. Sit up and lean your upper back back against the seat, instead pressing the lower back and reaching and rounding. A bonus to moving the car seat forward, is that by sitting back instead of reaching forward, your chest and face are farther from the airbag, said to be safer. - Use a lumbar roll, described above, if needed. - Sit with your hip all the way against the back of the chair. - Move the seat in and sit closer to the desk so you can sit up instead of hunching forward. - Put the monitor up on a book, block, or shelf. Try an external keyboard for laptops. Even without a seat back, you don't have to slouch or sit uncomfortably straight. Make sure not to strain to "sit straight." Don't increase inward lower back curve. Without a seat back, you can still sit comfortably. Move your seat further in (forward toward the desk). Put the monitor up on a block or shelf. Keep the keyboard up on the desk, not under it on a keyboard tray. Don't overdo the inward curve of the lower back. Depending on your height, lower your seat as needed so you don't reach down for the desk. News articles came out that misinterpreted a study that said "Don't sit up straight." They never mean that you should slouch, or that rounding your back and neck was better than keeping the spine straighter. What they found was that leaning back (with good positioning) is less work on the back than sitting upright vertically. When they said "Don't sit straight" they meant "Don't sit vertically". Not that you shouldn't sit with spine straighter rather than rounded. A certain amount of "work" (exercise) is fine for the back. Don't be afraid of sitting vertically either. Just stop straining. Your own muscles need exercise and can hold you to sit upright without pain or damaging yourself. For long desk sitting, it is often more comfortable to lean back against your chair, but not to round and slouch to do it. Commercial airline, bus, and train seats are often rounded, encouraging prolonged, enforced rounding. - Depending on the shape of the chair, you will need to move the lumbar roll higher or lower. What is important is to understand why you are using it - to make the chair back shape healthy for you - and to pad it accordingly. - Sometimes two pillows are needed, one in the natural curve of your lower back, and the second above it in the space still left by the rounded seat. Adjust as needed. Use your brain to make it right, comfortable, and healthier. Sit upright and lean back to rest the back of your head against the head rest. two pillows may bee needed to allow you to sit comfortably straight, not rounded forward to fit the chair. - Flights sometimes have a video message encouraging in-seat stretching. Often the advice is forward bending. That is the last thing you need after sitting bent forward for so long. Instead, stretch your back and shoulders backward, not forward. Pull your chin in while leaning back. Breathe. Smile. Use the principles above to easily and inexpensively fix your existing chairs and sofas. A nice stretch you can use for editing papers, or relaxing briefly. If your lower back pinches when you do this, you are overarching the lower spine (increasing lumbar curve too much). Tuck your hip as described in the Fix Swayback article. More to come here about sitting on the floor, and squatting to rest and work. Check back! Food for thought - people sit in terrible posture on yoga mats waiting for class to begin (and often during class) that they actually think will magically, automatically *give* them good posture. They know sitting for long periods at a desk is terrible for your health, but sit painfully for long still periods on a mat and call it "meditation" and people will pay money for that. Not healthy, obviously. There are standing, walking, even running meditations. In a gym, people wear expensive workout clothes and go to classes or machines and SIT DOWN! Even lie down. In a gym! Elders who need standing and balance all the more are shunted to chair yoga and exercise. Get up. it is not fitness, or physical or mental health, for parents and their able-bodied baby or child to strap the child into what is essentially a wheelchair (stroller) while you lift little artificial hand weights next to them. It is travesty to think that lifting a baby causes back pain but lifting a magic little weight will fix it. Sitting, whether parent or child, in any class calling itself fitness is counter to fitness. Please get up and use your own muscles to support your body weight. Lift the babies for your weight lifting. Lift older children too. Get children out of stroller "wheelchairs" for these classes, and as often as you can in daily life, before you teach their bodies (and minds) to sit instead of move, dragging down their health and motor skills to increasing lows. Use my books to learn healthy lifting and carrying to increase strength and decrease back pain using good mechanics. Start with this summary article on Healthy Lifting. There is much to be said about sedentary children. More to come here. Check back. Somehow, people love to believe that sitting on an exercise ball or kneeling chair or other engineered or fad device will automatically make you sit straighter or better. Of course not. You can slouch the same on almost any surface. No rocker device, no special sitting strap, or the new fad of clothing with straps to claiming to hold you in proper position will actually give you healthy positioning. Some do nothing, others put you in worse positions or make you think you are sitting right when you are not. Sitting without slouched, strained, or over-stylized rigidly "correct" posture is up to you. 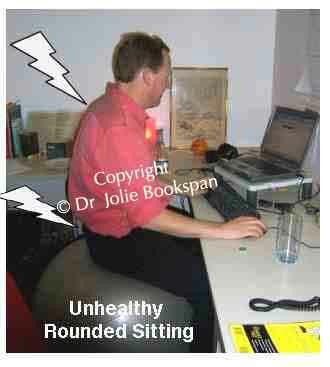 Sitting slouched on an exercise ball. A ball does not make you sit well or use core muscles. 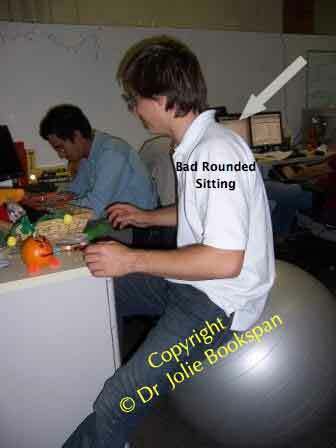 A ball does not make you sit upright or prevent unhealthful, uncomfortable sitting position. You can sit upright or not. It is not the ball, but you, that determines what you do with your own body. rounding even more to reach the surface. Use common sense and your own muscles for simple, comfortable, healthful sitting habits. Ball and bad and good chair sitting photos taken for me expressly by Healthine.com staff. Please do not try these bad postures at home. Healthline staff are trained professionals. Is Standing At Your Desk to Work The Answer to Stop Pain From Sitting? Obviously, standing is generally more exercise than sitting. Standing to work is often touted as the new cure for "sitting disease" which is not an actual, literal "disease" but the same harm of sedentary life. A problem comes when standing to work perpetuates the same problem people make when sitting - slouching, craning, swayback, and doing everything except what is healthy and sensible, then mindlessly calling it a fitness activity or thinking they have some strange new disease when they hurt from slouching when standing. Upper back pain from standing is usually from rounding forward too much. It also comes when you stand with too much inward lower back curve (swayback) - then lean the upper body forward to compensate. My web page on neck and upper back pain explains. 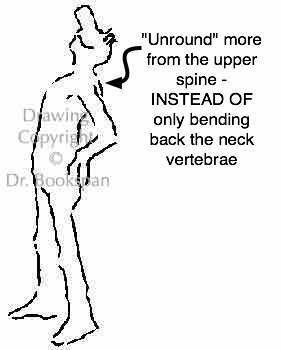 Sometimes people lean the upper body backwards, causing lower back pain, as explained below. When they round or crane the neck forward to balance or compensate, their neck and top of the shoulder may hurt. Lower back pain from long standing is usually typical of a certain kind of slouching - increasing the inward curve of the lower back, called hyperlordosis. My web page about fixing back pain from long standing explains that strengthening abs does not fix this, but how you use them to position your spine. No matter how well you sit, it's still a lot of time spent bent at the hip and time spent off your feet. It's sedentary. You lose physical capacity (mental too). Short, tight hip muscles add their own posture and pain problems. Your hip needs standing weight for strong bones. Your legs need use. Long sitting, even pain free, isn't healthy.Your body and mind and spirit need movement. This isn't strange new-age stuff, but long-known. Studies of space flight where astronauts don't have benefit of the pull of gravity, experience devastating losses of bone, muscle, and cardiovascular status. Sitting all day and doing a few exercises won't undo the large damage. Stand more. Even for my wheelchair patients, I recommend pulling to a stand for time every day. It is that important. Get up. Move. Assess your day. It is a startling realization to count the numbers of people who go to gyms and sit to lift weights and "exercise.". Elders are told to sit for exercises somehow thinking it is safer or preferable. Yoga enthusiasts sit for an hour actually believe it makes them stronger. If you want to exercise get out of your chair. Even sitting on a ball isn't exercise, it's sitting (for gosh sakes). 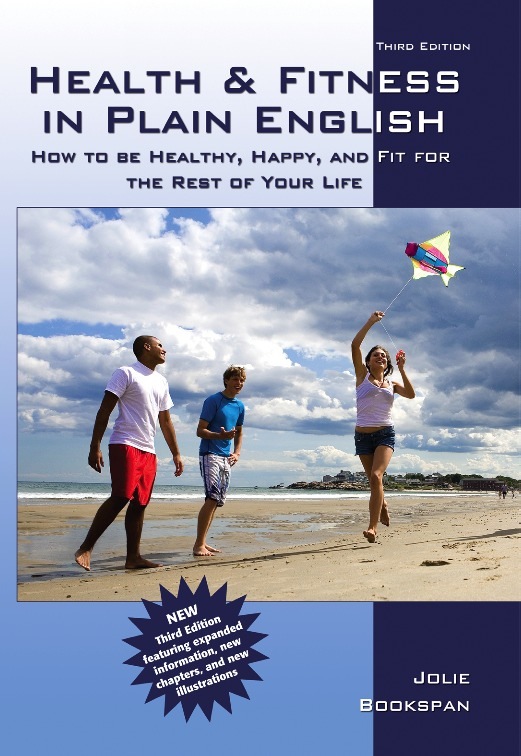 My book Health & Fitness - How to be Healthy Happy and Fit For The Rest of Your Life" is a fun compendium of hundreds of ways to have healthier movement all day, along with healthy everything else. See it on my BOOKS page. Thanks for checking it out. Stand up and straighten out. If your pelvis tilts forward (belt line down in front) straighten it to neutral spine - away from the bent "behind-stuck-out" position - see the free abs article and the back pain article for details of how. Movement is key to your health. If you sit all day for work it is no mystery that you hurt. Learn basic healthy movement skills to use to fix a lot of pain with my Bookspan Basics functional fitness page and Fitness as a Lifestyle which will show you how to use healthy movement for your everyday body mechanics even in the office. Another nice stretch to straighten out after house chores or exercise is to lie face down and prop up on elbows. Don't pinch or crane your back or neck. Gently stretch the entire spine and hip the other way. Remember that is more time off your feet and to use it to feel how to straighten then apply it to when you stand. When you look upward, straighten from the upper back. Don't pinch or bend back your neck or lower back (don't increase swayback). 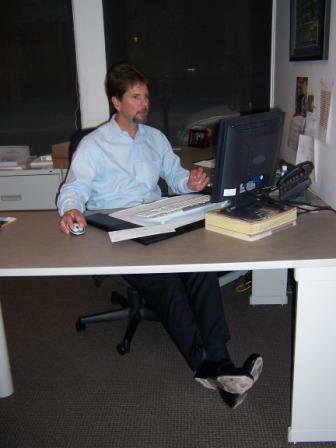 In 2009, I ran the contest "What Does It Take To Sit Upright?" We had great results. Bad sitting Photo 1 at left - Note the neck angled sharply backward, upper back rounded forward, and hip tilted backward (see the stripes?) What does it take to change to the easy relaxed upright sitting in photo 2 at right? Name the muscle(s) and action you think is needed - don't name a muscle, say which way it needs to pull. Is muscle strengthening or stretch is required to change from first (unhealthy rounded) to second (upright) sitting? Disregard the leg position in the two photos - the question is not how to move the leg, those were the two photos I could find. Focus on describing how to change yourself to upright sitting without needing to move the leg. Use your brain. Partial credit applies. Extra Credit - Explain why the same people (with the same tightness or weakness) who sit with the lower spine rounded forward (flexion) often stand with the lower back overly curved inward (hyperlordosis) - just the opposite. 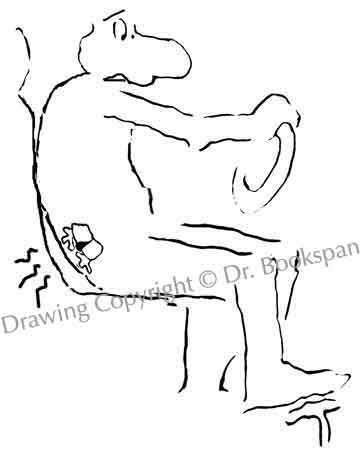 Sit and try it yourself, don't go only to anatomy books. I am working on putting those lost articles here on my web site soon, including winners and photos. I developed a set of six quick stretches that can be done pretty much anywhere, anytime, quickly to restore range of motion in all planes, and that relate to how you need to move in real life. 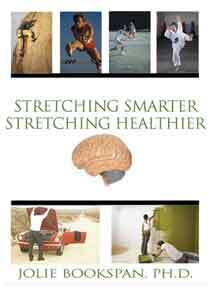 Check my web page on this site for Healthier Stretching. Scroll down to Six Quick Stretches. There are photos and complete instructions for each one. Below is a photo of my students from my Black Belt Hall of Fame class of 2016, who learned how to do and teach the Six Quick Stretches. 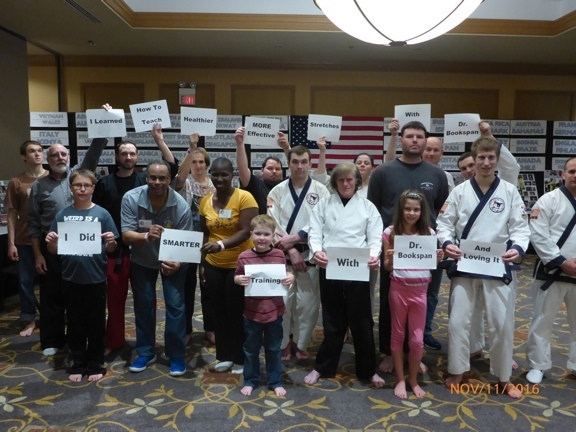 Back row are martial arts teachers, front row are their students. It is not true that you must sit at 90 degree angles (or any specific angles) or hold your thighs parallel to the floor, or other strange, strict rules about positioning your arms or legs. Don't worry about exact angles. Get the concepts, then you can keep healthy posture while you go about your life. Don't sit frozen in place. Movement is important for joint health. Joints don't have much blood flow. Joints get nutrition in and waste out by physical movement. Move freely in your chair instead of sitting still for hours at a time. 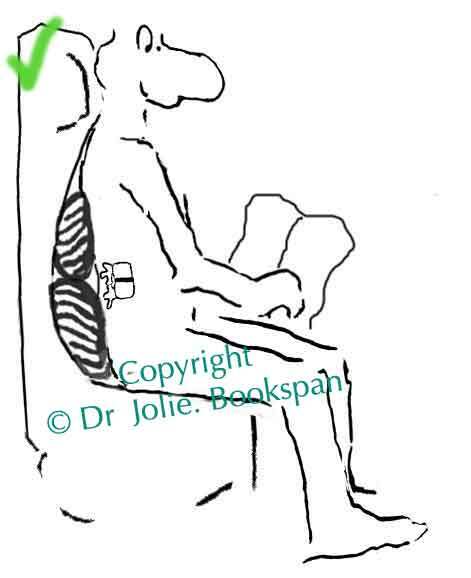 Sit in healthy position whether the chair has straight back, a round back or no back. When you use a lumbar roll or any towel or jacket for the same purpose, understand what it should accomplish. Then you will be able to think where it should go and how large it needs to be to accomplish that. You are the one to determine your positioning, not the chair. Keep it simple. Sit well without rounding your back forward or overdoing the inward curve of the lower back, not jutting your chin, not hanging your neck forward, not lifting the chin, not straining rigid "straight" posture. You will be able to get up after long sitting with straight happy position and no pain. It should be direct and straightforward to start getting your life back and start feeling better right now. Don't wait. How Long Does It Take To Stop Neck and Back Pain With Healthier Sitting? If it hurts you ARE doing it wrong. Stop and assess. Check what you are doing compared to what is presented above. None of this is "exercises" to "do" or "ways to sit" but retraining drills for body and thinking to learn to stop sitting in injurious painful ways and learn healthier ways where you can be comfortable and mobile and healthy at the same time. Are you still rounding forward? Are you craning your neck? Are you using an expensive (but wrong) ergonomic keyboard tray? Are you sitting forward of the seat back and letting your back sag like a "hammock?" Is your chair made in a way that you will round and curl if you relax against the seat back? Don't let it dictate your sitting position - use the techniques above to be able to relax in the many healthier positions. Are you tightening or clenching anywhere? Trying to sit "straight" and rigidly? That hurts, and is not necessary. Posture rules often cause as much or more pain than slouching. Are you sitting in specific rigid angles of the hip or legs or arms, or holding a presumed "correct" posture? That often causes more pain. Are you combining injurious stretches and exercises, or ineffective sitting rules form other sources? 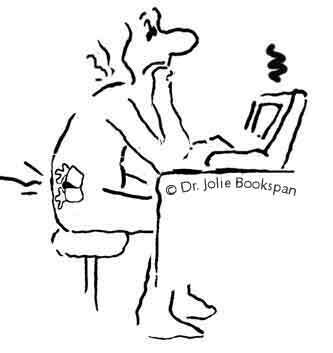 Remember - Fixing pain is not "doing" a bunch of exercises or stretches, then going back to sitting badly. Are you doing things that you do not understand? 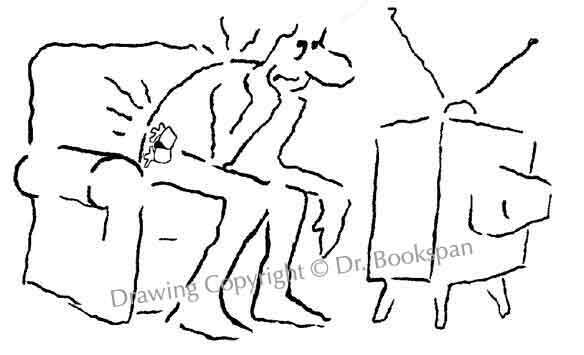 Make sure that you see what is the problem first before changing things.Make sure there is not something else contributing to your pain - many common prescription drugs and supplements that are not needed in the first place, a bad chair, an expensive ergonomic chair that is not really so ergonomic, or that you sit in wrong. 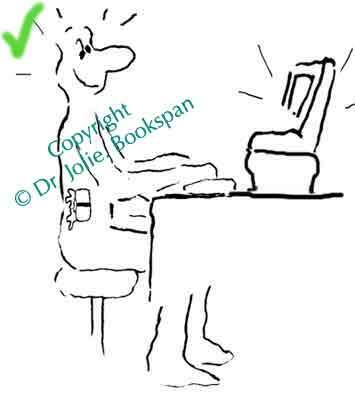 Please do not e-mail saying, "I read the article, now please tell me how to sit right" or "I am doing the exercises 10 times and still sit rounded or too tightly arched, now please write me a personal article on how to stop my pain" or "It hurts to sit at the computer to read your book on fixing pain" or " I am holding a "correct" position without moving a muscle so tell me what is wrong." Here is the answer now: If you stop hurting yourself with bad sitting, then the pain can stop. This free article tells how. More free articles on my Sports Medicine Office page. The books tell more. Watch how other people sit - it helps remind you why it is not a mystery when people hurt. Notice injurious positioning and movement habits, especially those featured in fitness and health magazines. Notice your own sitting habits. Don't waste money on expensive ergonomic chairs or sitting devices, rockers, straps, etc. Inmost cases, you can can sit well on a bucket. Fix your own chair or change it simply using simple principles above. Please don't combine other people's injurious stretches and exercises or ineffective sitting rules, then come back to me and say my work isn't fixing that. Get out of your chair often, straighten out, get outside for fun and real life.Try it now. Send me photos and your success story showing the principles in action. Prizes for best candid. If you want to throw a few dollars toward keeping this site running, or to say hello, that's great! Secure and safe through PayPal. Thank you! This is the work I do for you because I care - No salary or paid job to write all this and provide this site. Donations go to pay for this site so you can have this info, for scholarships to my classes for underprivileged, to charity, and developing more methods for YOU. Or send nice notes, LIKES, tweets, fixes for typos on my site, ways to make this page better, or something you'd love to do from the Projects page. Save your money on unnecessary overpriced ergonomic chairs and silly devices, medical treatments and worry. Anything is appreciated, especially, knowing that you benefited. Individual Care Online Private Consult. Personal written answers to your questions. Patient Success Stories. Not testimonials, but tutorials so you can do it too. Read how others fixed their own pain and see how to send yours. Adventure Medicine. Higher, faster, stronger, smarter, funnier. More Free Summaries on This Web Site. How to Fix Back Pain, Knee Pain, Leg, Foot, Hamstrings, more. Click the Clinical Page and scroll down to "Start Right Now." Academy of Functional Exercise Medicine. Fellow Advancement, Awards, Better Earth through Dr. Bookspan's Academy. TWITTER Tweet nice notes and success stories how you are better, which is my big reward. Prizes for the best ones. Follow me on Twitter @TheFitnessFixer for health updates, quick & short. More sharing buttons at the bottom of this page. TYPOS. Are You A Helpful Reader? If you found typos, broken links, or things needing correction on my site, tell me so I can fix them to help everyone, with my thanks: typos@DrBookspan.com. Mental & Emotional Training. A page of my short articles for stronger emotional health. The Fitness Fixer Dr. Bookspan IS The Fitness Fixer. My column ran on Healthline from 2006 to 2010. After that, they took them all away in favor of their own articles that sell medicines and treatments, The BlogSpot archives still have some of them. Check for articles on Achilles pain, foot, shoes, orthotics, knees, back, nutrition, and more by alphabetical listing. Click here for fun Index. Updates through Twitter, above. Bookspan Basics. Quick good biomechanics retraining drills for healthier life, fitness, sports. Teachers and trainers can use these in school and team programs. Cool T-Shirts, Mugs and Fun Stuff. How to fix pain printed right on funny items. UNcommon sense gifts from the Academy. New BLUE cover edition. The diving cult classic. Hard to find. Written by Dr. Jolie Bookspan, the Navy researcher who did the work in the field. BLUE cover is the latest edition. (Green was old) Get the new BLUE. 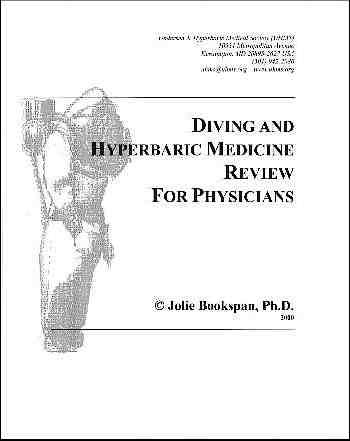 Signed collectors edition, order directly from author, plus other diving and hyperbaric medicine books and resources - through the BOOKS page. Orders and more descriptions on the BOOKS page. Even if you don't get my books, click book links and get whatever else you want. Amazon will send this site some pennies for orders through my links, without ever sending me your name. Have fun! This information is © copyright and here for you for a healthier life. Information, drawings, and photos are © protected copyright. To cite this article or any parts, put author Dr. Jolie Bookspan, and link to this site DrBookspan.com at the top and bottom of your reprinting. A suggestion to get my books is also nice. No Derivative Works License means no changes to content, wording or links. 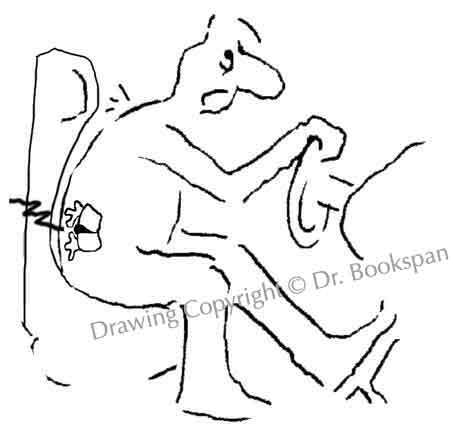 Drawings of Backman!™ copyright © by Dr. Jolie Bookspan from the books Health & FItness THIRD new edition, and Fix Your Own Pain.